You don't have to be the CEO of a major corporation to be a leader. I believe that everyone is a leader is some aspect. I'll talk more about how important the book Impact: Great Leadership Changes Everything is for moms in just a minute. First let me tell you a little about the book and author. For more than 25 years, organizational psychologist and management consultant Dr. Tim Irwin has worked with thousands of leaders in well-known global companies. He knows most leaders work for recognition and advancement and they want more challenge and responsibility. He’s also found this to be true: Most of us want to make a positive difference through our work and to have our lives count for something more than simply making a living. We want to make an impact. 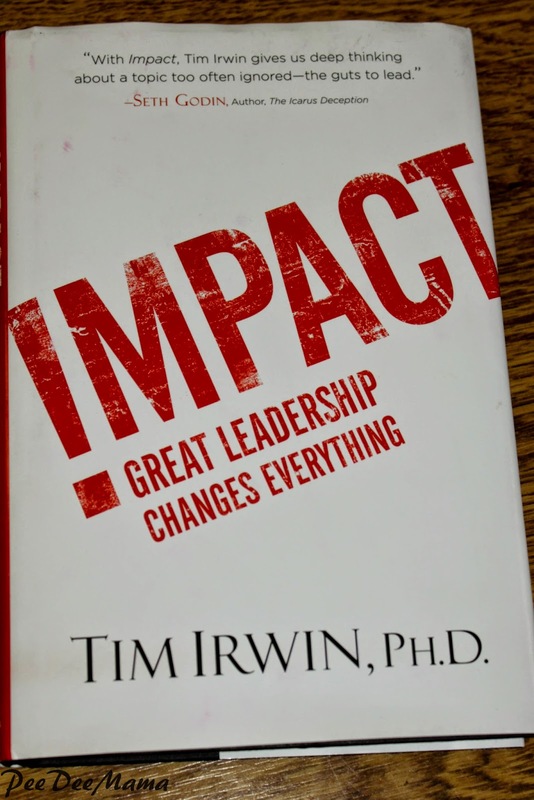 About the Author - Tim Irwin, Ph.D.
Dr. Tim Irwin, the author of the New York Times best-selling book Impact: Great Leadership Changes Everything, has been a confidante to thousands of global leaders. He is a favorite guest of Hugh Hewitt and is being featured on a number of Christian radio programs. Irwin sees one central issue anytime a leader “derails”—he believes they have a defect in their “core”, which Irwin says goes beyond the overused term “character”. His new book, Impact, addresses this and gives actionable ways leaders can protect themselves, and better serve their organizations—especially crucial for those of us who serve in ministry and are walking a Christian walk. Like I said earlier, I believe everyone is a leader in some aspect. While reading this book, I found so many things that I can easily apply in my life. As a homeschooling mom, I definitely hold a leadership role throughout the day. If I am not an effective leader, the small people won't follow - by not being obedient, by not doing their best on their schoolwork, etc. Throughout the book, Dr. Irwin challenges the reader to look inside at his/her core - the feelings, thoughts, and beliefs that drive our actions. This isn't easy; according to Dr. Irwin, "Our culture makes it easy to operate at a surface level. "(p.25) At the end of almost every chapter, there is a section labeled "Go Deeper" that contains checklists or questions to help the reader apply the principles in the chapter. There is also an online assessment you can take to help you measure and enhance your potential for living a life of impact. "If we wish to lead skillfully, we must consider the forces that have made us who we are." (p.27) If we want our children to be skillful leaders one day, we have to remember that WE are part of those forces who are shaping them today. "Areas of the brain responsible for planning, prioritizing, and controlling impulses are the last to mature." (p.68) This is so important to remember and I'm hoping that it will help me be more apt to extend grace when they do a poor job of controlling those impulses when they're young and also help guide them to do a better job as they grow older. "Humility must be strong and all-encompassing to protect our personal core from the inevitable stressors in our lives." (p.79) Are we teaching our children to be humble? I see too many children who have no humility because society teaches us and our children to put themselves first instead of doing for others. You can learn more about Impact: Great Leadership Changes Everything by visiting the official website, liking on Facebook, or following on Twitter.